The Jabberwocky is the Questing Beast. There have been many questing beasts, and there will perhaps be more once the Jabberwocky is slain. There are many places where it might live, but in Centerra, it lives in the Riddlewood, near Travia. DMs: Put it on any random encounter table you wish, as long as it is on a forest, mountain, or swamp hex. Inform your players of this. Everyone has heard of the jabberwocky, and everyone knows that if you pass up a chance to hunt it, you will never have another chance. A questing beast only appears once to any given person, if ever. If they players do decide to hunt the jabberwocky, the party must drop what they are doing and pursue the jabberwocky. The jabberwocky always stays one step ahead of the party. It moves horse-speed if they have horses, and foot-speed if they are on foot. This is not a simulationist pursuit, it is a mythical one. The jabberwocky leaves an obvious trail. The party can follow it easily enough. The jabberwocky is always one step ahead of them. 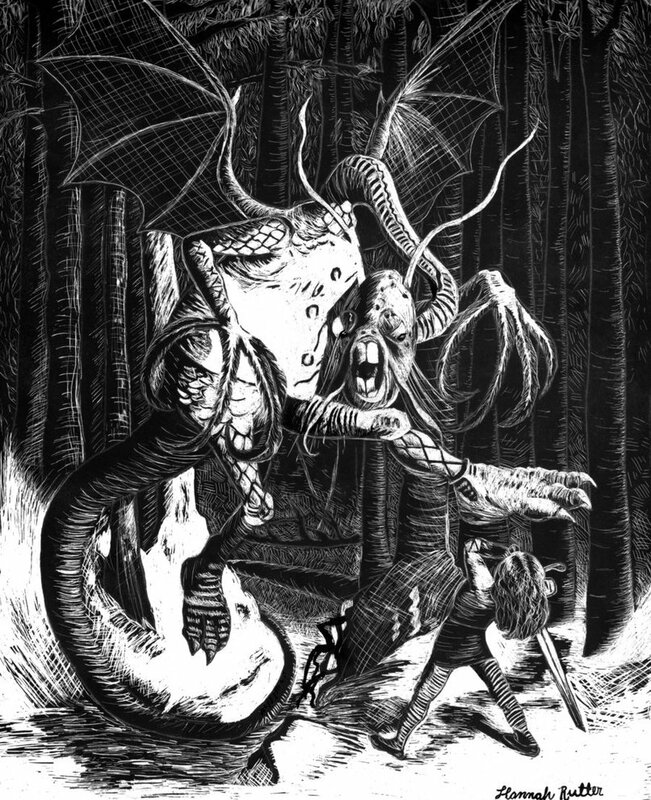 If the party abandons the trail for more than one day, they lose it, and will never again encounter the jabberwocky. If the party tells anyone else about the jabberwocky, or hires a bunch of people to help them hunt the jabberwocky, they lose it, and will never again encounter the jabberwocky. Tell your players this the first time they hear the jabberwocky's burbling. Each person only ever gets one chance to hunt the jabberwocky. If they ever fail to pursue it when they hear its burbling, or abandon the trail for more than one day, they lose it forever. If they tell anyone about the jabberwocky, or recruit any help, they lose it forever. 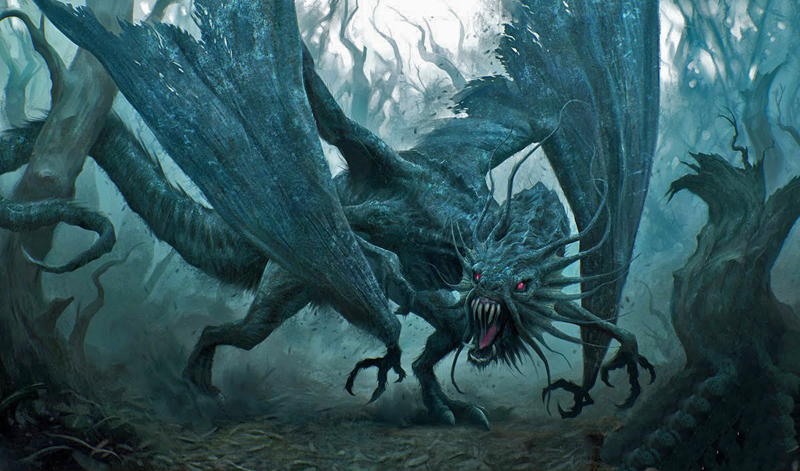 The jabberwocky has a burbling voice, burning eyes, whiffling wings, and claws that catch. Any sword that kills a jabberwocky becomes a vorpal blade. Anyone who presents the jabberwocky's head to the king of Kyr gets a knighthood, a castle, a parade, and a great deal of marriage offers. If you want to know the jabberwocky's route through the hexes, look at this table. If this path would take it out of a forest, mountain, swamp, or jungle hex, the jabberwocky changes direction randomly in order to stay in those types of hexes. It avoids doubling directly back on its path, if possible. This direction is the new "straight ahead"
So, I use a lot of the numbers on a random encounter die (more about it here). If the party is pursing the jabberwocky, they have a 1-in-3 chance to bump into a quest event every time they roll a random encounter check (twice per day). If you're using two random encounters per day, the party will be bumping into one quest event every 1.5 days. So the party might very well bump into the jabberwocky in less than a week of searching. But given how the dice work, this is going to vary wildly. The first two times you roll on the quest event table, you roll with a d12, so there is no chance of bumping into the jabberwocky. But on subsequent rolls. . . you might. And the first time the party bumps into the jabberwocky, it flees as soon as it gets below half health (see Whiffling Wings, below). The party then encounters it automatically the next time they get a quest event, and this time it fights to the death. So expect them to kill it after about 10 days of hex-crawling. Maybe. Again: highly variable. Some of these are framed like moral tests. They aren't. The questing beast doesn't care if you're a sinner or saint. However, nearly everyone believes that the questing beast can only be killed of someone who is pure of heart. Widows searching for their husbands, who were looking for the jabberwocky. If you help them search this part of the woods, you will find them: four headless knights, their necks cut through perfectly. One was crushed to death. Nearby are four dead horses and 4 helmets. Slightly more searching will reveal 4 heads in a tree stump, their skin sucked off and then well-licked. Beggars begging for money. Their leader (King Drudek) has a trained monkey who steals compulsively. King Drudek has tried to get his monkey to stop doing it, but lacks any skills in training the monkey. They know that people looking for the jabberwocky are often generous, and contribute to the stories about how hunters must be virtuous. Pilgrims asking for food. Their leader (Mother Yathen, Clr 2) can provide healing. 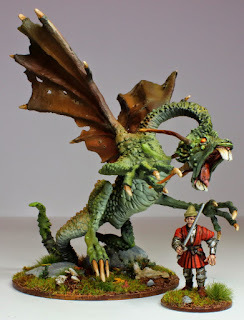 She doesn't believe that there is such a thing as a jabberwocky, and claims it is a symbol of mankind's violent urges. 1d4+1 Questing Knights looking for the jabberwocky. They will want to duel the party once they realize that they are following the same trail. They will want the loser to abandon the hunt immediately, and will do the same if they lose. They are despondent even if they win; they have been questing a long time. Lion, Puma, or Tiger with its foot caught in a trap. If approached in a non-threatening way, it will leave the party alone and limp away. It doesn't matter if the party frees the lion or not (neither is immoral). If the party frees the lion, there is a 25% chance that the lion will appear later on to help the party fight the jabberwocky. Otherwise, the pelt is worth 100g. A Knight (Sir Thalidomides, Ftr 3) who is abandoning the hunt. He is riding home; the beast never appeared to him. 2d4 Bards (Brd 1) led by a tiny man named Matthias. They are on their way to meet the prince, and they have been promised a handsome fee to entertain him at his hunting lodge. They will insult and ridicule the party, because they are giant assholes. Lost Prince (Prince Fonterion, age 15, escaped from bandits when the bandits chased after the questing beast) just wants to go home. Anyone bringing him home will be richly rewarded. Anyone who delays in bringing him home will earn substantially less (a fact that he will continually remind people of). 3d6 Bandits looking for a lost child, the son (Maccus Jr.) of their beloved leader (Maccus). The son is hiding in a tree, terrified of a strange beast he saw. He will need soothing before he climbs down. Druid (Balanost, Drd 7, pacifist) who knows of the party's quest and is determined to convince them to abandon the quest. The beast is just an animal, after all, and it has a right to live, too. He will reason with the party, but will fight back if attacked. His companion hides nearby (giant chameleon). Undead Knight (Bartleby, Ftr 5) wants to die in an honorable duel, because he is disgusted by his undead state (a witch cursed him with undeath, and if the curse is removed he will be alive again). If one of the party members obligingly kills him honorably, he will tell you where he has buried 1000gp, and ask you to bring it to his wife in a nearby city. She is a person of some importance there. Jabberwocky asleep in a small cave. You can hear it snoring in there. The cave has a second, hidden entrance, directly above the jabberwocky, big enough for the PCs to drop on it or for the jabberwocky to escape. Jabberwocky squatting on a rock beside a stream, washing its hands and staring directly into the sun. It seems to be talking to someone, but there is no one there. Jabberwocky burbling furiously and throwing itself from a high place (tree, cliff). Jabberwocky gazing at its reflection in a pond and weeping. Jabberwocky eating a doe like a snake. The doe is still alive. Jabberwocky enjoying a rare moment of tenderness with a young girl, who is petting its nose. Jabberwocky laying an egg. If allowed to hatch, it contains 2d6 full-grown, non-magical snakes of different species. Jabberwocky surprise attack! It bursts from the trees and gets a surprise round! Vorpal Head Bitey - Free claws are used for grabby claw attacks (Str 20). 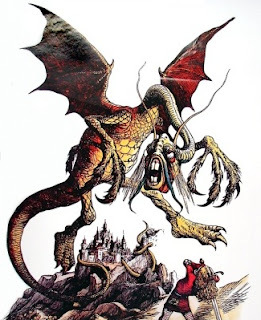 If the jabberwocky begins its turn holding a person, it will attempt to bite off their head with it's rat-like incisors (2d6 + save or die). If it is holding a second person, it will merely shake them or bash them against the floor (2d6 damage). Burning Eyes - At the beginning of the jabberwocky's turn, the jabberwocky picks a person in 50' to glare at. If that person fails a save, they are blinded for 1 round. Also applies to mounts that the target happens to be riding. Creatures with darkvision automatically fail this save. Burbling - The jabberwocky's mad burbling is infectious. All creatures in 50' constantly babble nonsensically. Basically, you lose control of your mouth (no save). The DM should feel free to tell each player what their character is babbling about each round. (I recommend something from Lewis Carroll). Spellcasting is impossible. This babbling madness extends to the players, not just the characters. The physical players around your table (whose characters are within 50' of the jabberwocky) are forbidden from speaking except in nonsense noises ("Eeeoooflorporflibbity boo! "), declarations of what their character is doing ("I want to throw my net on the jabberwocky. "), or questions about the situation ("Is the jabberwocky close enough for me to hit it with the net?") Pantomiming is also forbidden, unless the player wants to spend their character's next turn waving their arms around. Players who break this rule are assumed to be pantomiming stuff, and lose their next turn. 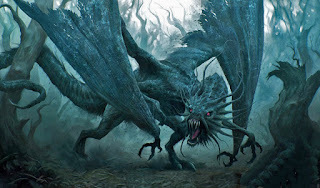 Whiffling Wings - When the jabberwocky is reduced below half HP, it will throw away anyone it was holding (prone + dex check or take 1d6 fall damage) and fly away on its small, tattered wings. This means that the hunt is nearing the end, and the next quest event will automatically be with the jabberwocky. (Roll a d8+12 on the Quest Events table.) The jabberwocky will only flee the first time; on subsequent fights, it will fight to the death. The jabberwocky heals 1d8 HP the first time it flees and every night after that. Vorpal Blood - A non-magical slashing or piercing weapon that gets the killing blow on the jabberwocky becomes a vorpal +1 weapon. A non-magical bludgeoning weapon that gets the killing blow on the jabberwocky shatters into a million pieces. Good rules. I might use this on my players, I'm sure they would enjoy it. The Jabberwocky is known to have severe diabetes and peanut allergy; you can kill it with a Snickers snack-size. Pure gold! I don't normally do random encounters, but I want to do so now.
. . . what happens if you befriend it instead?